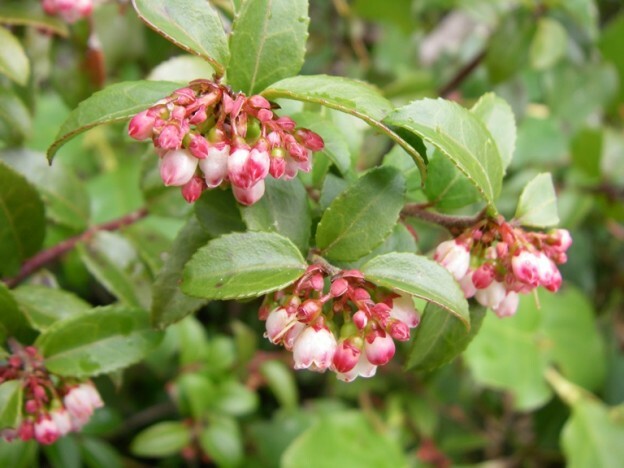 Names: Evergreen Huckleberry is also called California Huckleberry, Evergreen Blueberry or Box Blueberry. 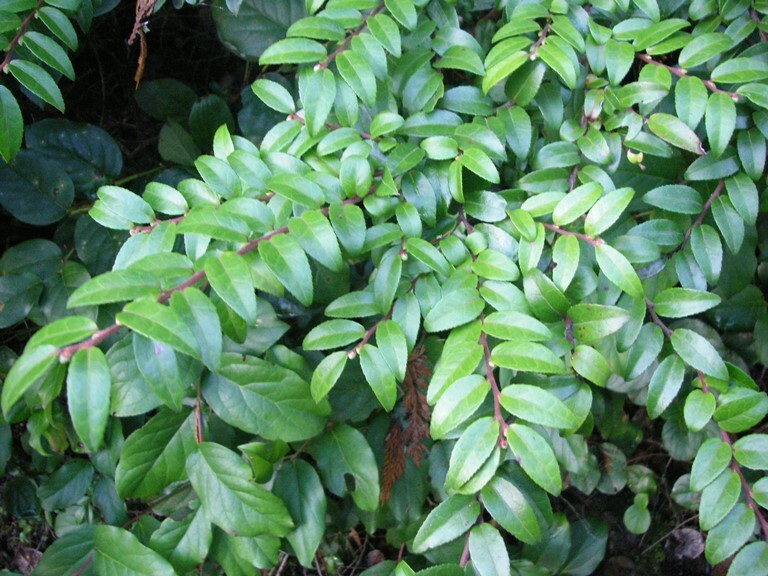 Ovatum refers to its oval-shaped leaves. 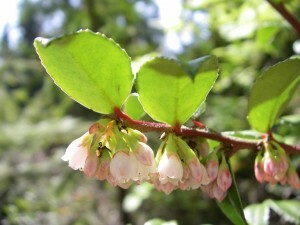 Relationships: There are about 450 species of Vaccinium worldwide, about 40 in North America with about 15 in the Pacific Northwest. The genus Vaccinium includes Blueberries, Huckleberries, Cranberries, Lingonberries, Whortleberries, Bilberries and Cowberries. Other Northwest Vacciniums will be discussed later under the sections on Deciduous Shrubs and Groundcovers. Distribution: Evergreen Huckleberry is found on the west side of the Cascade Mountains from British Columbia to California. Along the coast of California, it is common to the redwoods but sporadic further south. 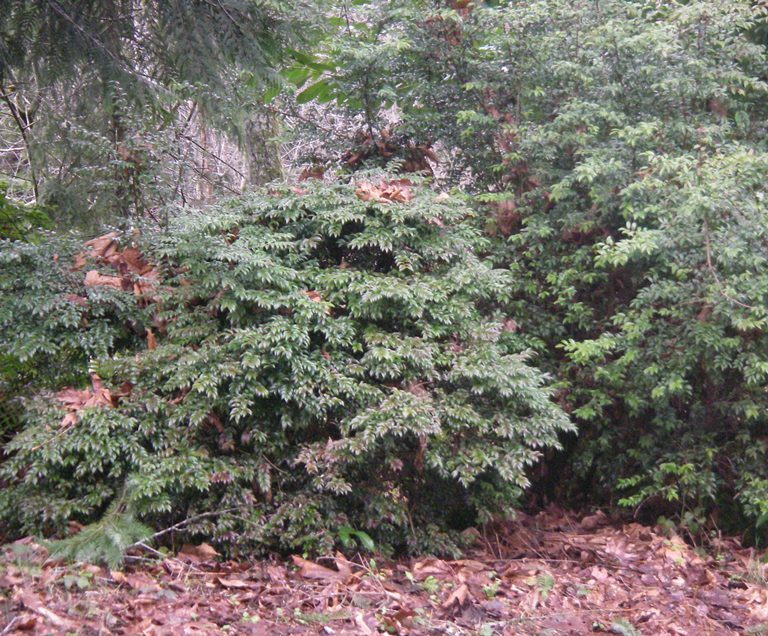 Growth: Evergreen Huckleberry grows slowly, reaching 3-6 feet (1-2m) in the sun and 12 feet (4m) or more in the shade. Habitat: It is very common in second growth forests, especially along edges and openings. 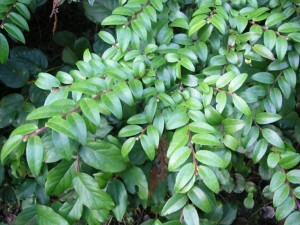 Diagnostic Characters: Its oval to lance-shaped foliage is evergreen, leathery and irregularly toothed (1-2 inches or 2-5cm long); often with a pinkish-brown or purplish tinge. The flowers are pinkish-white bells, typical of many of our ericads. 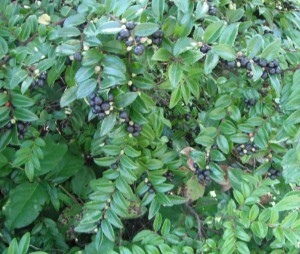 The fruits are usually small purplish-black berries. 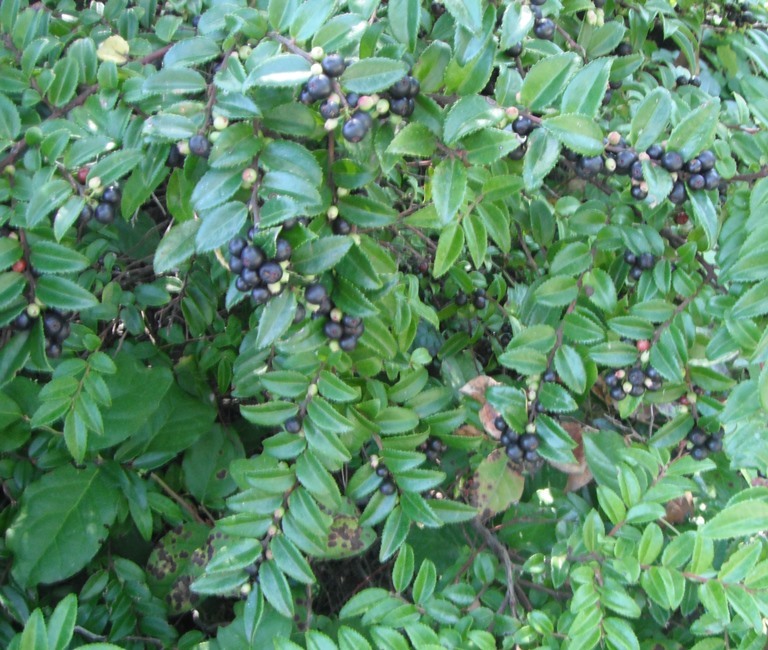 Sometimes you may find plants with berries that are larger and bluer with a waxy bloom resembling blueberries. Pinkish-white bell-shaped flowers are attractive to many different pollinaters, including hummingbirds! 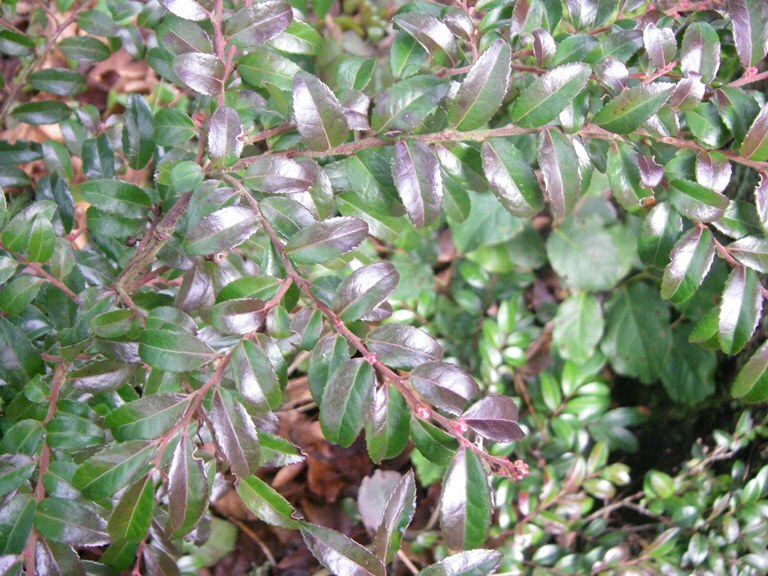 Foliage is sometimes purplish or bronzy, especially in winter. 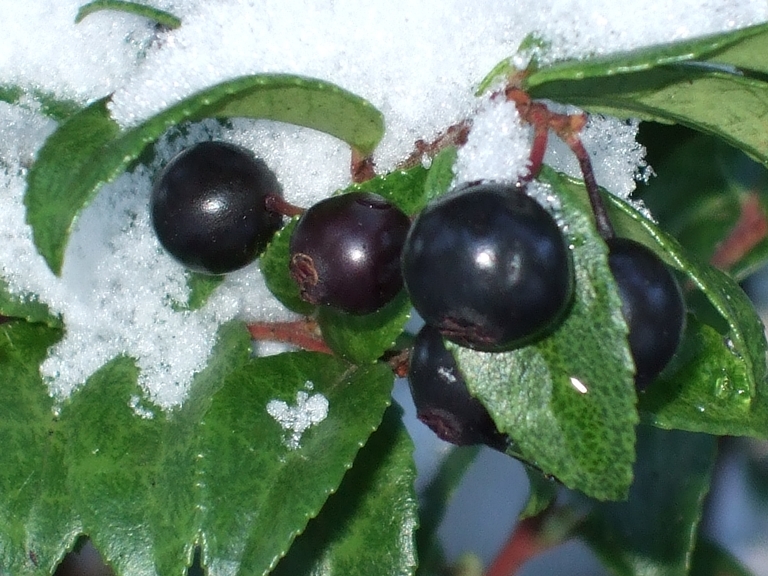 In the Landscape: Evergreen Huckleberry is very versatile in the landscape and should be included in almost any natural revegetation project. It will form an attractive hedge given time. 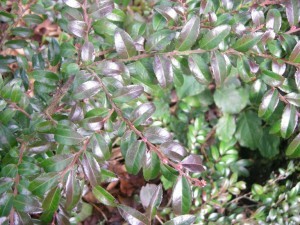 New growth of Evergreen Huckleberry is often reddish. Phenology: Bloom Period: April-May. Fruit ripens August to September but often remain on the plant through December. Huckleberries taste sweeter after a frost! Propagation: Seeds are slow to germinate, but have no special requirements. However, stored seed may benefit from a stratification period. Seedlings grow slowly and require 2-3 years to produce a saleable plant. Even so, it is better to plant container-grown nursery stock with intact root systems. Wild-dug Evergreen Huckleberry does not transplant well. Hardwood cuttings are someitmes successful. 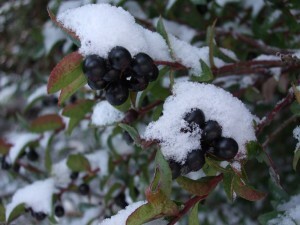 Use by People: Natives ate the berries fresh or dried them into cakes. Today, common lore asserts that they are sweeter after the first frost. The berries are a bit tedious to pick and separate from the foliage, but are delicious baked into muffins. 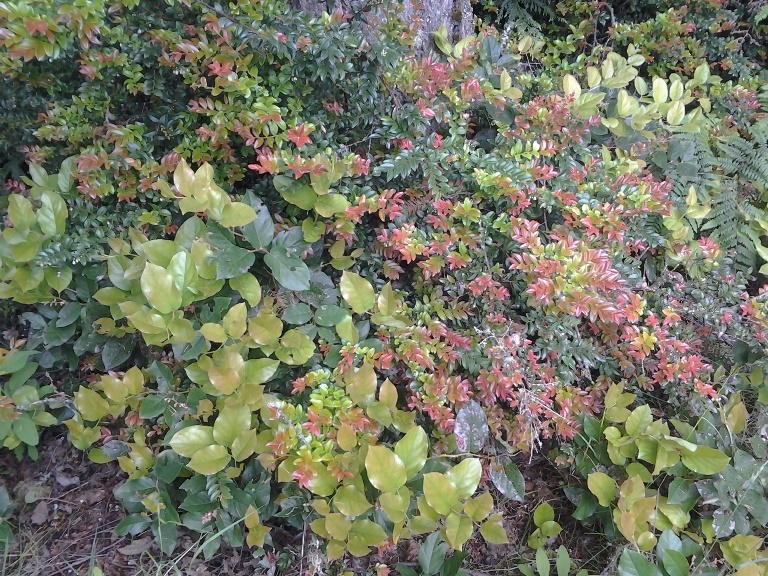 As for Salal, “Brush-pickers” collect Evergreen Huckleberry foliage for the florist trade. Huckleberry Cleaning Machine on display by the Key Peninsula Historical Society at the 2015 KP Farm tour. 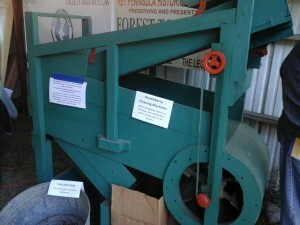 The machine separated leaves and other debris from the berries. Use by Wildlife: Many songbirds and mammals eat the berries, including black bears, chipmunks, and mice. Deer, elk, rabbits, and grouse browse the foliage. Flowers attract hummingbirds, butterflies and other pollinators. This entry was posted in Evergreen Shrubs on October 7, 2015 by habitatdana.